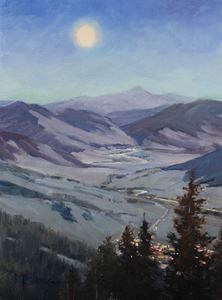 Susan McCullough's #6, "Moon Over Creede" is the winner of the Summer Nights Online Contest! Susan will receive a copy of Richard Schmidt's book, "Alla Prima 2" and her painting will be featured on the home page of the PAPNM website. Over fifty PAPNM members voted in the contest. Congratulations, Susan!